When USB microphones came on the market, they were mostly low-cost, plug-and-play devices designed to offer ease of use for consumers. 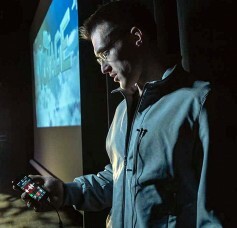 Now, as the mics have gotten better, smaller and more portable, pros are attracted the convenience of USB mics and accessories for a wide range of work. As with most categories of pro audio gear that began as consumer products, the devices mature with time and professionals tend to slowly gravitate toward them. Today, most major microphone manufacturers make USB mics. High-end models work at 24bits/96kHz or better, which is considered the sweet spot for professional use. A popular pro quality USB mic is the Apogee MiC ($229), which is compatible with Mac and iOS devices and is very portable for travel. It works at 24 bits/96 kHz, has 40dB of gain and a cardioid polar pattern. Designed for use with Apple’s GarageBand, it is now used with a range of DAW software. It comes with a Lightning cable, a desktop stand, an adapter for a standard mic stand and a USB cable. Sennheiser’s MK 4 digital Condenser Microphone ($399.95) comes with Apogee’s A/D conversion and works at 24 bits/96 kHz with a Mac, PC or iOS device. The mic’s gold-plated one-inch diaphragm, coupled with its low 10dB(A) self-noise, capture professional quality voices or musical instruments. It handles 140dB SPL, which means it will not be overloaded by loud sounds. If the MK 4 is too large for pros on the move, Sennheiser and Apogee have partnered on a line of smaller mics. A favorite with reporters is the MKE 2 digital ($499), a device that couples a Sennheiser MKE 2 lav mic with Apogee’s 24-bit/96 kHz A/D conversion. It outputs to a Lightning connectors for iOS devices. This is great for journalists who want to do high-quality field interviews using an iPhone in a package that weighs virtually nothing. An iPhone app handles all the recording and it can be used anywhere. The MKE 2 digital can also be used as the soundtrack for video production as well. DPA’s new d:vice MMA-A ($650), about two inches in diameter, is an ultra-compact digital audio interface that is controlled through a remote application on any iOS device. The app allows users to store gain settings, low-cut filters and presets. It comes with one Micro USB-B to iOS (Lightning) and one Micro USB-B to Mac/PC (USB-A) cable. The d:vice’s MicroDot inputs allow it to be connected to all DPA miniature microphones, including the d:screet Miniature, d:fine Headset, d:vote Instrument and even the d:dicate Recording microphones with the optional MMP-G preamp. This DPA package allows two-host podcasts and or interviews to be done with a tiny gear package. 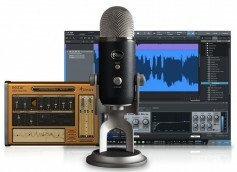 Blue’s Yeti Pro ($269.99) is a desk-size combo USB/XLR studio microphone with a tri-capsule that can record in stereo, cardioid, omni and bidirectional models at 24-bit/192 kHz. In a package deal it comes with PreSonus Studio One Artist DAW and iZotope Nector Elements for sweetening vocals. It is designed as a simple, plug and play recording system. Shure’s MV51 ($199) is one of the new MOTIV series of USB mics. There are five presets for on-board digital signal processing that can be accessed instantly from the front touch panel. Users can also dial in EQ and dynamics via a free app, which allows recording to be set at 24-bit/48 kHz. The MV51, with a one-inch capsule, is very travel friendly and works with about any type of computer, including iOS devices. For those who already have a favorite mic, but want the convenience of USB plug and play, Rode makes the i-XLR ($149), a digital interface that allows a passive XLR mic to work with any iOS device. 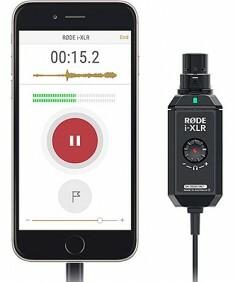 It offers an XLR to Lightning interface that allows reporters to capture professional-quality dialog to a smartphone or tablet. It also has a headphone output with adjustable level on the body, making it easy to monitor audio during the recording session. Another option is CEntrance’s MicPort Pro ($199.99), which features a portable mic preamp with a 24-bit/96 kHz A/D converter, switchable 48V phantom power, hefty headphone amp and studio-grade control knobs. 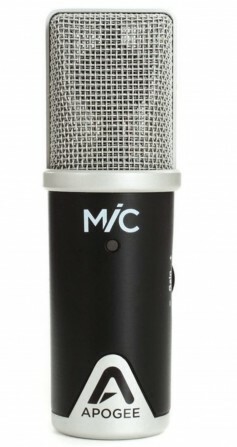 Used by the BBC, CNN, NPR and voiceover artists worldwide, the MicPort Pro works with any computer or iOS device and requires no drivers or batteries. 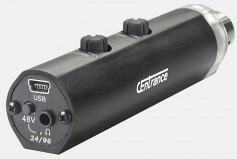 It plugs into any professional XLR mic. This just scratches the surface of the high end of USB mics and interconnect devices. Very tiny USB interfaces and portable USB mixers from a wide range of manufacturers are also small enough for travel anywhere and offer more capability that a single USB mic. We have reached the point where super portable, yet very high quality, portable audio is a reality at affordable prices.